Once your online store is setup, all your focus and energy can be redirected back to sales and marketing because it's basically like your shop whereby you can sell your services and products, except that it's open 24/7. When it comes to a successful online store, success depends on your ability to present the most relevant offers to the most promising prospects, who will most probably buy. Besides that, the design, the layout, the navigation, even to the fonts, all play a part. However, one of the most under-rated factor for a successful online store is actually the support. An online store is your investment in the long run. Do you have the capability to handle coding, spam, fraud, bugs, or when there is new technology? Is there anyone who can assist you by advising you if it's necessary for your online store? Is there anyone who can guide you on the cost and technical parts? And finally, if things doesn't go smooth, is there anyone who can rectify the problems immediately? Just a side note: As Singaporean Web Developers, we will be able to solve your problems much faster. You won't be pushed from sales to support, vice versa, neither will you need to worry to speak to different sales, different technical guys because we will dedicate team members for your online store so you will be speaking mostly to the same persons, who knows your website, your online store, and your needs inside out. As mentioned at the start of this page, once your online store is setup, all your focus and energy should be redirected back to sales and marketing. However, this can only be achievable with a capable support team like us so that you don't have any worries. Contact us for your next actions so that we can advise you accordingly. 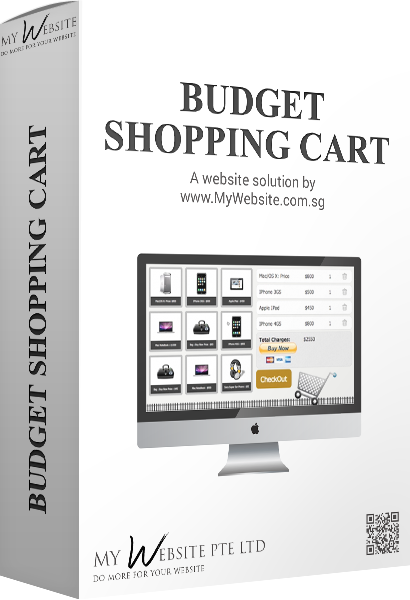 Alternatively, if you are looking for something budget but still with the ability of letting your customers buy online from you, you may like to have a look at this Budget Shopping Cart.